Dutch breeders created the Fresian Water Dog about 400 years ago, probably from an older breed that was simply known as Old Water Dog. The dogs were originally used by fishermen to kill otters. When otters became less trouble for fishermen, the dogs began being used for hunting and guarding. The breed is very rare and is found almost exclusively in the Netherlands. 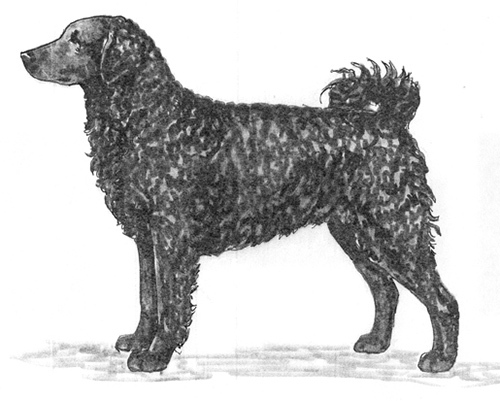 The Fresian Water Dog was recognized by the United Kennel Club in 2006. A rugged, sturdy breed that is well balanced, square and covered with curly hair, except on the face, which is smooth. Intelligent, stubborn and independent, the breed is friendly with its family and good with children but suspicious of strangers and makes a good guard dog. The head is dry, strong and powerful. The skull is slightly rounded, wider than it is long, and slopes gently into the cheeks. The skull and muzzle are of the same length, and the stop is slight. Powerful, tapering slightly from eye to nose, but not pointed. The nasal bridge is broad and straight. The lips are tight fitting. The Fresian Water Dog has a complete set of evenly spaced, white teeth meeting in a scissors bite. Well developed, with open nostrils, black or brown depending on the color of the coat. Medium size, oval in shape, with tight fitting lids, the eyes are placed slightly slanting, giving the dog a somewhat grim expression. Color is dark brown for black dogs, and brown for brown dogs. Set rather low and carried close to the head, the ears are moderately long and shaped like a mason’s trowel. They are covered with curly hair that is rather long at the set on of the ear, gradually shortening to the tip. Short, strong, arched and carried low. No dewlap. The shoulder blade is well placed against the chest, obliquely set and well angulated. Powerful and straight, with upright pasterns. The body is very powerful. The chest is wider than it is deep, so that the forefeet are rather wide apart. The ribs are well rounded and reach well back. The back is short and straight, and the loin is strong. The croup is only slightly sloping. The underline is moderately tucked up. The lower thigh is not too long. The rear pasterns are short. Round, with thick pads and well arched toes. Long, and carried as a ring tail curled over, or beside, the croup. With the exception of the head and legs, the body is covered with tight curls of firm hair. The coat is coarse, and has a greasy feel. Serious Fault: Sparse or thin hair which gives the dog a wooly appearance. Solid black, solid brown, or black or brown with white markings, with or without ticking. Ideal height at the withers for males is 23 inches. For females, it is 21.5 inches.